What are DOCSIS Codeword Errors? YOU ARE HERE::Home/Broadband Monitoring & Diagnostics/What are DOCSIS Codeword Errors? 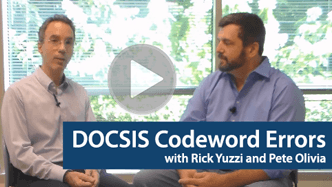 DOCSIS codeword errors are a key indicator of when your cable plant may be experiencing issues. Learn what codeword errors are and the difference between correctable and uncorrectable codeword errors.